PENN STATE (US) — Scientists have created a process using three inexpensive computer programs that gives fingerprint grading unprecedented consistency and objectivity. “People leave behind all kinds of fingerprints, and the job of a forensic examiner is then to look at a fingerprint and identify a person who could have left it,” says Akhlesh Lakhtakia, a professor of engineering science and mechanics at Penn State. “Various scenarios can be envisioned where a fingerprint can be seriously altered. Fingerprints usually undergo environmental weathering and smudging. 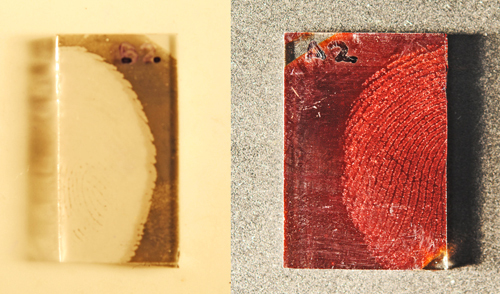 The condition of a fingerprint affects how reliable a match can be between a collected print and prints on record. Knowing a fingerprint’s dependability can minimize the chance of a wrongful or delayed conviction. The process Lakhtakia’s team created uses the computer programs to grade a fingerprint for the availability of ridge detail for subsequent identification. Computerized grading ensures standardized evaluation to a degree finer than any human can accomplish. Their results are detailed in the current issue of Forensic Science International. The three separate computer programs include the FBI’s Universal Latent Workstation—usually free to qualified agencies, the open-source image editor GIMP, and a simple custom program written in Mathematica to count pixels. The US Department of Justice funded this research.